Sandro Botticelli was an Italian artist who achieved great success and notoriety in his native Florence during his own lifetime. His nickname came from the Italian for a small wine cask, namely a Botticello. Early promise shown by Sandro was to land him an incredible opportunity, as a artist apprentice, which was a prized role for the son of a tanner. Clearly, his raw skills had been noticed, and from then on this artist was to take full advantage of the luck which had come his way. Fra Filippo Lippi provided the level of tutorage needed to get the most out of this young painter, and Sandro was to later repay this faith by training his own son, Filippino. 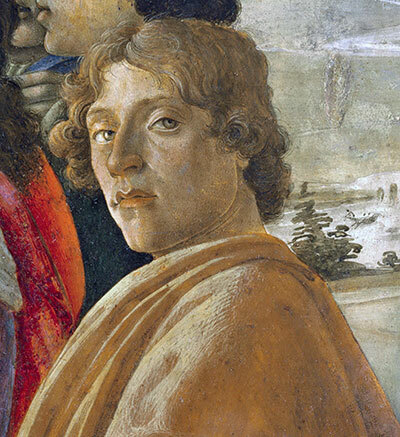 His connection to the Lippis helped Botticelli to take over many of the new commissions for Florence's rich and famous, now that Lippi the Elder has passed away. Wealth was everywhere to see in Italy during the Renaissance and Florence was at the forefront of this artistic extravagance, aimed at out doing the other Italian Papal States. The Medici family are renowned in Italian history for their prominence in a variety of political and social circles, and they provided enough work for Botticelli to keep him busy all his life. They were also open to the idea of secular themes within the artist's work which brought about stunning paintings such as Primavera and Birth of Venus. Underlying these were also exceptional drawing skills. Italy was, and remains, a deeply religious country where wealth, power and the church were all deeply intertwined together. As such, artists looking to tackle other topics in their commissioned work would rarely receive backing. The Medicis allowed Botticelli a little more artistic freedom and in return they were rewarded with some of the finest art of the Italian Renaissance. More on the artist's life is explained in our biography. Sandro Botticelli continues to be regarded as one of the most significant members of the Italian Renaissance, alongside the likes of Michelangelo, da Vinci and Raphael. Outside of Italy there were many who took their influences to other regions of the continent. Bruegel, Bosch and Durer would provide elegant contributions from Northern Europe, whilst the following centuries would produce new art movements that directly linked back to the achievements of artists such as Botticelli. Sandro Botticelli (original name was Alessandro di Mariano Filipepi) was one of the most prominent Renaissance artists in Florence, Italy, which was the core for ground-breaking painting in the fifteenth-century Europe. His famous paintings included The Birth of Venus, Cestello Annunciation and Primavera and are time and again said to symbolise the spirit of the Renaissance. From his drawings, see the famous Dante's Divine Comedy series. Botticelli's pigments were the finest during his time, including malachite, ultramarine, red, white, red lake, cinnabar, copper green, and carbon black. He applied them in thin and opaque layers called "scumbles", but he frequently glazed the dark greens and reds. Botticelli's method is substantially distinguished in painting the flesh tones, where semi-transparent ochres, cinnabars, whites, and red lakes are placed over each other in such tiny brush strokes that the gradations are amazingly invisible. He drew women with pale and porcelain-like faces, using the faintest pink blushes in the cheek, nose and mouth areas. Botticelli created several effects by adding together water or oil to his paint. He used tempera combined with oil, also known as tempera grassa, for stronger, fuller, and more opaque colours. At times he diluted tempera with water allowing him to craft semi-transparent, glass-like glazes of colours. As tempera dries, colours usually become softer and fade. Botticelli habitually returned them to their natural shades by applying an unsparing layer of varnish. Botticelli was mentored by a goldsmith and before he joined Filippo Lippi in the studio. He started using gold as an ornamental element in most of his artwork. Shell or ground gold is combined with egg whites and used on the clamshell of his famous paintings. He also used brush strokes of gold to underline the green foliage in most of his paintings. He also used a method known as sgrafitto to create delicate gold decorations to clothes and veils. With sgraffito, a coat of gold is smeared on the canvas and covered using paint. A wooden stick is then used to mark designs that look like beautiful gold patterns on the material. Most of Botticelli's paintings are done on wooden panels that are coated with gesso, primer, or a chalky surface. He would often apply a light-tinted wash before painting. Botticelli also used the conventional method of using egg white in thin overlaid layers. Each thin layer of glaze changes the impact light has on the colour. Some of his paintings illustrate subtle traces of crosshatching brush strokes with several coats of paint. This crosshatching brings out a moulded, 3D effect. This is the most famous painting by Botticelli. It is a portrait of a traditional myth; The Birth of Venus. In his time, classic tales like this one were well-liked among the educated classes. Probably commissioned by a member of Medici family in Florence, this artwork portrays Venus emerging from the sea and led to the shore by gods of the wind. He adroitly captures the motion of the goddess and the tale of her birth, which in turn has come to symbolise the dawn of beauty in the world. Currently, ‘The Birth of Venus’ is displayed in the world’s legendary Uffizi Gallery in Florence. Also shown in Uffizi Gallery is La Primavera, which is also called Allegory of Spring, an artwork that he completed in 1482, four years before The Birth of Venus. The painting shows Venus and other mythical figures in a garden. The garden’s flourishing greenery is a symbol of the growth brought by the spring season; in fact, the natural setting is so detailed that there are hundreds of different types of plants and flowers. This makes this painting so unique and eye-catching. This painting is usually thought to be a portrait of Simonetta Vespucci, a gracious young woman who was said to be the most beautiful in Florence. Vespucci married at the age16 and passed on at the young age of 23. However, she was a great inspiration to many artists of that time; led by Botticelli. Some people believe that she played the role of Venus in Botticelli’s most celebrated works, The Birth of Venus and La Primavera. In this portrait, the young lady is mythologised as a goddess or nymph, with an intricate coiffure that includes beads, feathers, and ribbons. Disclaimer: Sandro-Botticelli.org is a personal website covering the career of famous Italian painter Sandro Botticelli, but is in no way an official website for Sandro Botticelli and www.Sandro-Botticelli.org does not claim to be that in any way. The Estate of Sandro Botticelli and their presence hold all necessary copyrights and licences for all of his paintings and other works. All prints, paintings and photos included in www.Sandro-Botticelli.org are provided as an affiliate to Art.com who hold necessary permissions. Art.com pay us small commissions based on any prints or paintings that you buy as a result of using this website.